Are your old dentures threatening your health? Millions of adults and senior citizens wear dentures. But most denture wearers do not see a dentist for annual oral exams and routine preventive care. They often pride themselves on keeping the same dentures for many years; this can be a big mistake. WHY MAINTAIN YOUR DENTURES AT THE DENTIST? Annapolis restorative dentist Dr. Djawdan recomends you visit his Annapolis dentist office at least once per year so he can examine your dentures for evidence of wear and a secure fit. This is important for overall dental health as well as the ability to enjoy a good daily quality of life for as long as possible. 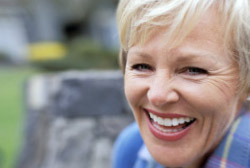 Wearing down the teeth on your dentures can result in distorted facial characteristics, collapse of the bite and closure of the airway. It also lends a more aged appearance and can begin to make eating and speaking clearly more difficult. When the denture is made, it fits the jawbone at that time. However, as the jawbone shrinks over time and with age, it changes the fit of the denture. Dentures need to be replaced at least once every seven years. They will begin to slip, increase the risk for periodontal disease and make daily living more difficult. Poor fit or worn dentures can be the of cause sleep apnea, stroke or even death. Yearly oral cancer screening exams of denture users are also extremely important. Many pre-cancers and cancers of the oral cavity can be found early, during routine screening exams by a doctor, dentist, or dental hygienist. Dr. Djawdan performs an oral cancer screening when you visit his Annapolis dentist office. This is why an oral cancer exam is an important part of your visit to the dental office -whether you have natural teeth or not! Your dental health, including the fit of your dentures, plays an important role in long term health and physical well being. If you have old dentures or dentures that no longer fit comfortably, schedule a visit with Dr. Djawdan in Annapolis and restore your natural, functional smile.